What would happen to your bottom line if your new hires ramped 50% faster? 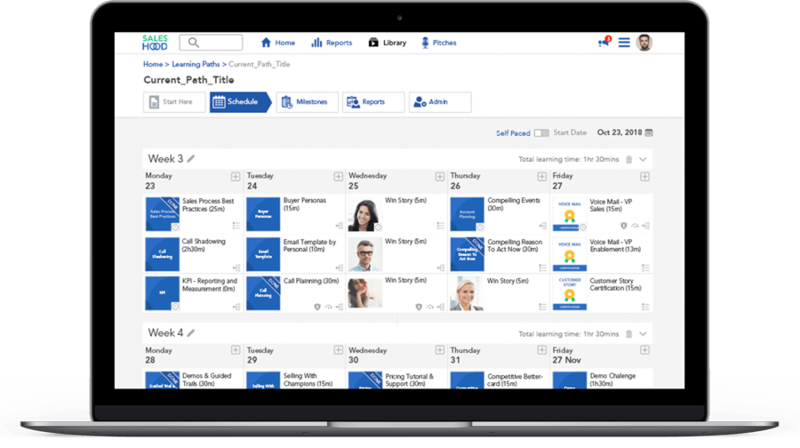 Become a hero and create rich onboarding with manager coaching, just-in-time learning and fast results. The secret to an effective onboarding program is proven content, active learning, and team coaching. Create your 30, 60, 90 plan by role. Curate relevant and just-in-time content, role-plays and knowledge checks. Engage new hires with learning by doing activities and pull in managers to coach and give feedback. Measure onboarding engagement and results to get teams hitting quota faster. to complete an onboarding process. The team at Tanium is on message and aligned from day one. How do they know? Their teams love practicing their pitches and learning from the best. The result is their business is growing 50% year-over-year — and reduced their time to first ramp by 70%. Curate onboarding paths for new hires to complete. Stack-rank new hires to show progress and completion. Engage managers in the onboarding process with notifications and coaching tips. Use video, mobile and peer feedback to make getting up to speed fun and impactful.